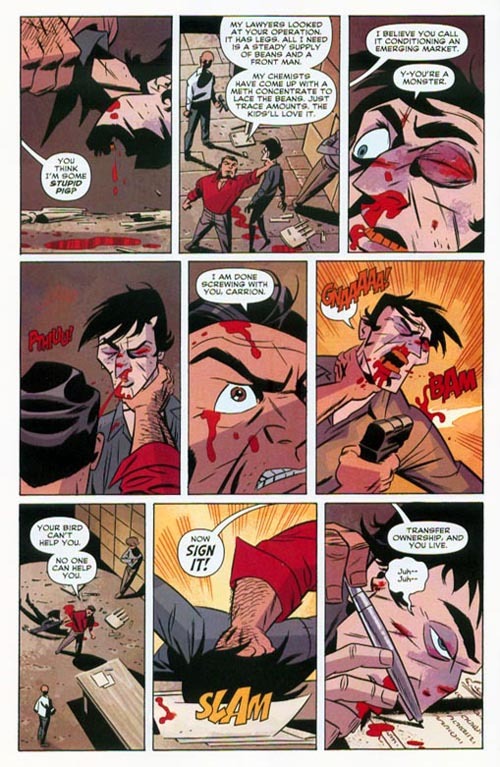 Via Dirk, my attention was called to this analysis of the page pictured at left, from Darwyn Cooke’s characteristically bland revival of The Spirit, issue 5. Now, I guess the criticism of the plot problems in the story is valid enough, although this is a broad, archetypical comic book story, not a realistic one. Cooke’s writing is invariably lacklustre. More glaring to me is the actual storytelling on the page. What’s up with the Cossack’s sleight of hand here? He makes the switch *three* times in one page (once while managing to fire a gun at the same time!) 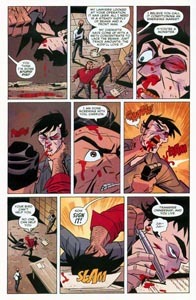 Not only is Cooke a sloppy writer, he’s a sloppy storyteller.